Lots of new items again! 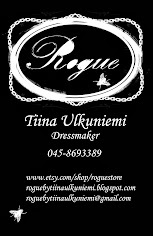 I wanted to make something which is not a garment so that you can have some kind of Rogue product always with you. I will list these to Etsy for you to buy or you can buy them directly by contacting me or buy them from Ateljeekatu shop that is located here in Tampere. Finally I made this Ouija themed hand bag. I made one few months ago and I wanted to make a bigger version that you can actually fit something inside. I have only 1 available with this kind of ball chain detail so if you want it you really need to be fast. I'm going to make more but they will look slightly different because the chain will be slightly different kind. The fabric is cotton and the print is in silver so that it goes better with the silver closure and chain. This bag is so amazing that I feel sad to sell it. I better make one for me asap. There is one pocket inside where you can put your keys or cell phone. I also made these coin purses. They are big enough to fit your bank card, money, keys or anything you want to use it for. These measure 12 cm in width and 14 cm in height. And then I have these bigger purses for make up and other things to carry around in your bag. These measure 18 cm in width and 17 cm in height. They are 22 € + shipping a piece.